Soft ice cream maker turns out creamy delights. 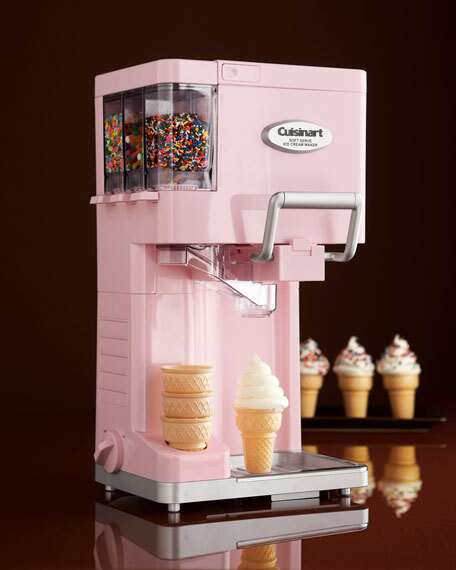 Serve ice cream, sorbet, frozen yogurt, or sherbet right in your own kitchen at the turn of a dial. Features three condiment dispensers and automatic function allowing you to pour in goodies for mixed treats. 10"W x 7.75"D x 18"T.
During a visit to France some years ago, Carl and Shirley Sontheimer came upon the demonstration of a restaurant food preparation machine. Carl, a retired physicist and accomplished cook, returned home convinced that the technology they had seen could be adapted for home use. He began tinkering, and in 1973, unveiled the first food processor. By 1988, the Sontheimers' ingenuity had given birth to Cuisinart, one of America's premier housewares brands.